Year of the Rabbit • S.L. County celebration aims to increase cultural understanding. File | The Salt Lake Tribune During the Chinese New Year celebration in 2010, the Inner Mongolian Dancers performed at Cottonwood High School. This year's event will feature a mask-changing act. File | The Salt Lake Tribune During the Chinese New Year celebration in 2010, the Inner Mongolian Dancers performed a rice-bowl dance at Cottonwood High School. This year's event will feature a mask-changing act. The Chinese community is days away from its biggest celebration of the year  one that will usher in the Year of the Rabbit. If you believe in the zodiac, it could be a good year for the Chinese bash. You see, rabbits love the arts. And the New Year's event will feature a straight-from-China mask-changing performance that combines magic and dance. Rabbits also are homebodies, the zodiac says. And home isn't where organizers want people to stay at 7 p.m. Tuesday as dancers and musicians take the stage at Cottonwood High, 5717 S. 1300 East. 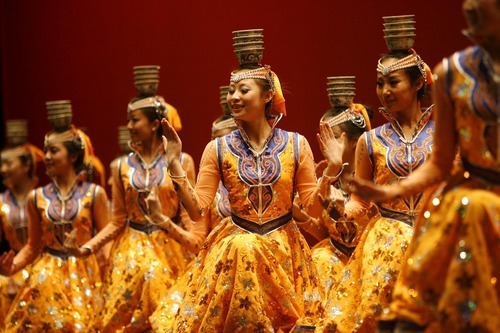 The free celebration is sponsored by the Confucius Institute at the University of Utah, which hopes to narrow the cultural gap between the Asian and American communities with two hours of made-in-China festivities. "It is important for the two countries to understand each other," said Fusheng Wu, director of the Confucius Institute, "because we are the most important players on the world stage now. To do that, I feel strongly that the local communities, the Chinese community and non-Chinese community of Utah, need to interact more." So Wu has attracted an art troupe from Sichuan University in China. The group will perform Tuesday during a whirlwind five-city tour, showcasing a magic mask-changing act that has roots 300 years deep in the Sichuan Opera. It's a tradition so shrouded in secrecy that organizers say fewer than 200 Chinese artists are capable of performing it. Rebecca Sanchez, who oversees diversity affairs for Salt Lake County Mayor Peter Corroon, sees value in the celebration, particularly if it draws a multicultural crowd. "The real key to our community becoming strong and united," Sanchez said, "is to start having an understanding of one another." Utahns already share a close connection to China. Aside from its sister-city and sister-county relations, the state's former governor, Jon Huntsman Jr., left his executive post in 2009 to become U.S. ambassador to China. "Utah and the China community have a very good relationship," said Eric Cheng, a member of the Chinese New Year Celebration Committee. "We feel a responsibility to bridge those two communities." Although the celebration happens next week, the actual Chinese New Year won't take place until a week later. The Year of the Rabbit will dawn on Feb. 3. It's an occasion that the Chinese community, even in Utah, will greet with homemade dumplings and red envelopes of "lucky money" for the children. So how significant is the holiday? Explained Wu, "It is like Christmas." P Albert Einstein, Frank Sinatra, Pope Benedict XVI, Angelina Jolie, Johnny Depp, Tiger Woods and Whitney Houston were all born in the Year of the Rabbit. The new year will unfold with characteristics similar to the zodiac rabbit. The Chinese define rabbits as refined, gracious, quiet, good-mannered, intellectual homebodies who enjoy their privacy and hate confrontation. What that means for 2011, according to prognosticators, is that nations likely will lean toward inaction rather than action when facing difficult issues. If a country is deep in debt, for instance, it probably won't take steps toward financial solvency. This will lead, in the longer run, to things being more difficult in 2012. Just as the rabbit protects its home from other elements, countries will begin to withdraw from the global community and be more concerned with what is happening in their own backyards. This could result in increased barriers to trade. The rabbit is a passivist, however. Its hatred of war will mean more public resistance to military conflicts. On the domestic front, people probably will pay more attention to the mortgage market and to the arts, both of which are important to the zodiac rabbit. P Rabbits are creative, compassionate and sensitive. They are friendly and prefer the company of others. They also avoid conflict. In confrontational situations, rabbits approach calmly with consideration for the other party. Because rabbits believe strongly in friends and family, lacking such bonds can lead to emotional issues.